Inspired by conversations on the FOOD52 Hotline, we're sharing tips and tricks that make navigating all of our kitchens easier and more fun. 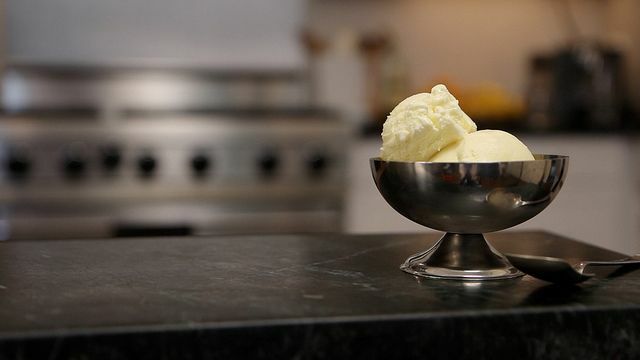 Today, our friends from Bi-Rite show us how to make their basil ice cream. This recipe (shown below) really serves two purposes -- it's a fun way to use up the season's basil and it's a perfect dessert for a hot late-summer day. Amanda even served it at her last Friday Night Dinner Party. Enjoy -- and if you want to see more recipes from Bi-Rite Creamery, check out their book Sweet Cream and Sugar Cones. Be sure to make this recipe in the summer when the basil is extra fragrant and flavorful. You won’t get the same results using basil grown in a hothouse in the middle of winter. 1. In a medium heavy saucepan, stir together the cream, milk, half of the sugar (1/4 cup), and salt. 2. Put the pan over medium high heat. Add the basil leaves to the pan. When the milk just begins to bubble around the edges, remove from heat and cover the pan. Let steep for about 20 minutes, or until a sweet basil flavor has infused into the milk/cream. (Taste it to monitor the progress – beware, it will become bitter if oversteeped.) Don’t be alarmed if the basil turns black, it won’t affect the color or flavor of the ice cream. 1. In a medium heatproof bowl, whisk the yolks just to break them up, and then whisk in the remaining sugar (1/4 cup). Set aside. 2. Uncover the cream mixture and put the pan over medium high heat. When the mixture approaches a bare simmer, reduce the heat to medium. 3. Carefully scoop out about 1/2 cup of the hot cream mixture and, whisking the eggs constantly, add the cream to the egg bowl. Repeat, adding another 1/2 cup of the hot cream to the egg bowl. Then, return to the pan of cream on the stove and, using a heatproof spatula, stir the cream as you slowly pour the egg and cream mixture from the bowl into the pan. 4. Continue to cook the mixture carefully over medium heat, stirring constantly until the mixture is thickened, coats the back of a spatula and leaves a clear mark when you run your finger across it, 1-2 minutes longer. 6. Freeze in your ice cream machine according to the manufacturer’s instructions. While the ice cream is churning, put the container you’ll use to store the ice cream into the freezer. Enjoy right away or for a firmer ice cream, freeze for at least 4 hours. This was a great recipe. The flavor was strong bit not over powering and it was perfectly creamy. This is my favorite type of ice cream now, my only tip is you should use a ball hand shaken ice cream maker. It make the ice cream much more soft. Hi, just made this recipe and the flavour is delicious, nevertheless once frozen it is really hard... cannot even dig my scoop in. I read that sugar plays an important role in the way an ice cream freezes, but I followed the directions stricktly. What could have gone wrong? Great video. Kris and Anne don't use whole milk because they think too much fat masks the flavor. Whoa! LOVE Bi-Rite ice cream. Makes me rethink using whole milk - never thought I'd say that. Yeah, I thought that was interesting. Then when we made the Alice B Toklas ice cream (which calls for a pint of cream), I really understood what Kris and Anne were saying about too much fat in ice cream. The custard is chilling right now, delicious.